Twenty-six years ago to the day, the New York Yankees took a gamble on a raw, young pitching prospect out of Panama named Mariano Rivera. Nearly three decades later, Rivera can look back on a sure-fire Hall of Fame career in which he set countless MLB records and earned five World Series championships. Only one team ever enjoyed the services of Rivera and his devastating cut-fastball: the New York Yankees. In honor of the 25th anniversary of Sandman officially becoming a Yankee, take a look at 42 facts about the greatest closer in baseball history, No. 42. 1) No pitcher in history has earned as many saves as Mariano Rivera (652). 2) Rivera didn't begin pitching until the age of 19 years old. 3) Mo recorded at least 30 saves in all but three of his 18 non-rookie seasons in MLB. 4) His first pitching coach was Hoyt Wilhelm, the first reliever ever to be inducted to the Baseball Hall of Fame. 5) Rivera signed with the Yankees as an amateur free agent on February 17, 1990 with a signing bonus of $2,500. 6) In his first season pitching in the Yankees farm system, Rivera, then 20, struck out 58 batters over 52 innings, and allowed just one single earned run for an ERA of 0.17. 7) Rivera made 10 starts in his career, all during his rookie season. 8) Rivera earned Cy Young votes in six different seasons, placing among the top-five in all but one of those. He never won the award, but was runner-up in 2005. 9) Hall of Famer Warren Spahn was the only pitcher to be selected to more All-Star Games (17) than Rivera, who earned 13 nominations. 10) Mo was the player that replaced Andy Pettitte on the Yankees' 25-man roster when Pettitte was optioned to Triple-A in May of 1995. Lefty made two starts, and returned to the MLB level for good. 11) Speaking of Pettitte, he and Rivera combined for 72 wins/saves in their careers, the most by any duo in MLB history. 12) Known today by his nickname, "The Sandman," Rivera tried out a pair of Guns N' Roses songs for his game entry music: "Welcome to the Jungle" and "Paradise City." 13) Mo earned his first All-Star nomination in 1997 at age 27, and his final career nomination at age 43 in 2013. 14) Rivera led all relievers in saves in three different seasons: 1999 (45), 2001 (50) and 2004 (53). 15) In 11 of Rivera's 19 years in the Majors, he posted an ERA lower than 2.00, including two seasons with ERAs of 1.40 or better (2005, 2008). Those 11 seasons are the most for any pitcher in history. 16) The Sandman is one of 51 players in MLB history to hail from the country of Panama. 17) No pitcher has finished more games than Rivera, who took the mound in the bottom of the ninth 952 times in his career. 18) Mariano has pitched in 1,115 career games all with the Yankees, nearly 500 more than the second-closest pitcher on the all-time list, Dave Righetti, who made 522 appearances. 19) Only seven Yankees in franchise history have collected more strikeouts than Mo, who fanned 1,173 batters during his career. 20) Rivera is one of two Yankees to earn MLB All-Star MVP honors, when he pitched a scoreless eighth inning in the 2013 Midsummer Classic. Derek Jeter is the other (2000). 21) Sandman owns the lowest career ERA (2.21) among Yankees pitchers all-time. 22) No pitcher in baseball history has pitched in more playoff games than Mariano Rivera, who has made 96 career appearances in the postseason. 23) The MLB record for lowest playoff ERA over a career also belongs to Rivera (0.70). 24) Unsurprisingly, Rivera has earned the most postseason saves ever, with 42. 25) Mo owns the record for most games pitched in World Series play, with 24 career appearances. That's two more than fellow Yankees pitching legend, Whitey Ford. 26) The only Yankee to retire with a World Series ERA under 1.00 is Rivera, who kept his career mark at 0.99 after winning his final championship ring in 2009. 27) Since saves became an official MLB stat in 1969, no reliever has earned more in the World Series than Rivera, who's collected 11 in seven trips to the October Classic. 28) In 16 of Mo's 19 MLB seasons, the Yankees advanced to the ALDS. He pitched to an all-time MLB-best 0.32 ERA in ALDS series over his career. 29) Rivera's signature pitch - the cutter - became widely known not only for fooling opposing batters, but also splintering their bats with unmatched frequency. 30) The Rolaids Relief Man Award was given to the best reliever from each league until it was discontinued in 2012, but Rivera collected five trophies during his career. 31) In 2012, Rivera missed all but nine games after suffering an ACL injury before a game. He returned the next season and won the AL Comeback Player of the Year Award, turning in a 6-2 year with 44 saves and an ERA of 2.11 in what would be his final MLB season. 32) For 15 straight seasons from 1997 to 2011, Rivera earned at least 25 saves, setting an MLB record. 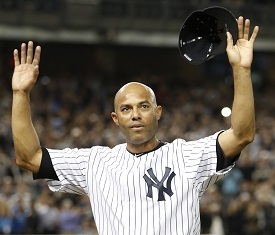 33) Since 1920, only one pitcher retired with a career WHIP of 1.00 or better: Mariano Rivera. 34) Mo was the last player in MLB to wear the No. 42, after it was retired league-wide in honor of Jackie Robinson. 35) On July 8, 2000, Rivera converted two saves in two different games inside two different stadiums, during a doubleheader against the New York Mets. 36) Rivera drove in his only career RBI during the 2009 season, in a June 28 win against the Mets. The night was also noteworthy for another major milestone: Rivera's 500th career save. 37) In 2009, Kansas City Royals first baseman Mike Sweeney once described Rivera's elusive cutter with this description: "You know what's coming, but you know what's coming in horror movies too. It still gets you." 38) Mariano Rivera III, one of Sandman's three son, was a collegiate pitcher for Iona College, and was drafted by the Washington Nationals in the fourth round of the 2015 draft. 39) Mo's 33 1/3 consecutive scoreless innings streak in postseason play, set during the third game of the 2000 ALCS against the Mariners, is an all-time MLB record. 40) Rivera played under three managers in his career: Buck Showalter (1995), Joe Torre (1996-2007) and Joe Girardi (2008-2013). 41) Rivera pitched his final career game on September 26, 2013, when fellow Core Four teammates Derek Jeter and Andy Pettitte ushered him off the mound in an iconic Yankees moment. 42) The Yankees retired Rivera's number on September 22, 2013, joining 17 other Yankees in history to receive the jersey retirement honor.